Noragami, the first season, was actually one of the very first anime that I started following as it aired. I was a newbie back then, wondering what this strange, foreign medium had in store for me. I remember seeing the main visual for the anime – all three of them sitting atop a red-shrine entrance with the city far below and a gloomy sky at their backs. That instantly caught my attention (still does), and the anime ended up being favorable to me. Now, a few years later, with many more anime and hence more experience under my belt, Noragami Aragoto, the sequel to one of my starters, appears. And it’s nice to know that this one holds up about just as well. Aragoto follows the first season, bringing back Yato, Hiyori, and Yukine for more god-related dilemmas. But this season, the anime splits itself up into two distinct arcs: Bishamon’s arc and Ebisu’s arc. Bishamon’s arc is easily the stronger of the two and, arguably, executed as well as it possibly could. As its name implies, these first six episodes revolve around Bishamon and her camp. Her role as a god of war, the Regalia she owns, and so on. Yato and his crew obviously take part – in more ways than one – but the true focus rests on the beautiful Bishamon. What’s seen, however, is anything but pretty. 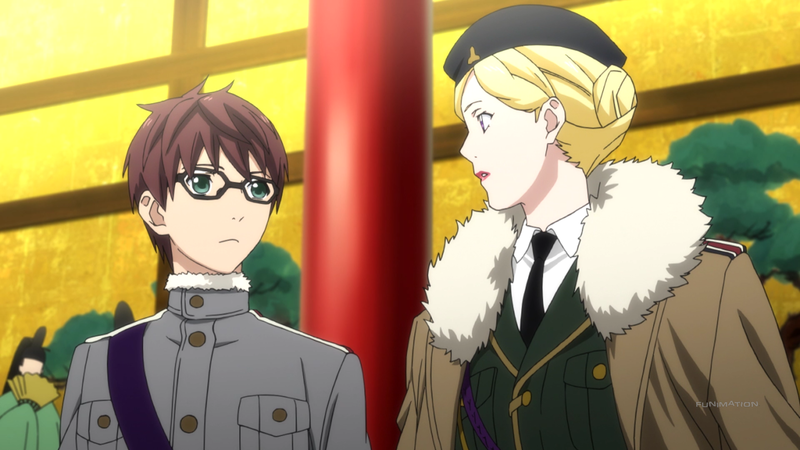 Major backstabbing amidst Bishamon’s group leads to deaths, misunderstandings, and turmoil. The loss of one of Bishamon’s lesser Regalia spurs thoughts about her current, incessant “generosity.” Bishamon exiles Kazuma, her closest and oldest partner, when she learns of him aiding her sworn-enemy Yato. And Bishamon’s almost-literal blind hatred for Yato made her unable to see the destruction happening within her own home. The strength of the arc comes from the clever use of the past. In cliché terms, history repeats itself. The destruction of Bishamon’s clan happened once before, so, ironically for this god of fortune, she goes through the same misfortune again. All the while, a theme on pain and protection persists. Pain pushes people to react. When someone touches a hot stove, he or she pulls his or her hand away. A toothache leads to a dentist appointment. A small cut or scrap gets an equally small Band-Aid. That is, pain is often seen as something unwanted, a negative. But Aragoto does not fully believe this sentiment. In the present, Bishamon suppresses her pain with medicine, rendering her unable to react to the needs of her numerous Regalia. By extension, her Regalia fake how they feel to make sure their master does not hurt, so them receiving a lack of attention continues. In other words, Aragato argues that pain can be a positive part of life. Yes, pain hurts, but it lets one learn and understand. It’s what makes people think twice about the actions they take. Protection has close ties to pain, for that’s what people do on a regular basis: protect themselves from pain. Seatbelts are worn while driving. People sit in comfy chairs at their desks. Feather beds, not hardwood floors, are used for sleeping. Naturally, people view protection as something wanted, a positive. Once again, however, Aragato does not fully believe that statement. Kazuma groveling at Yato’s feet protects Bishamon but leads to the destruction of hers and his family. Kugaha plotting to reincarnate Bishamon for her sake would protect her, albeit in a twisted manner. Even just Bishamon protecting as many stray souls as possible induces the problems at hand. That is, Aragoto argues that protection can be a negative. Yes, protection brings safety, but sometimes the cost to attain it cannot be justified. The two ideas intertwine, creating most of the conflict of this arc. It’s not until Bishamon embraces Aragoto’s arguments that the conflict subsides. I.e., she accepts the pain of her family by saving them with death by her own hands, and she releases Kugaha from her protection as a sign of pity and change. Sadly, Ebisu’s arc does not have the same level of execution as the first half. A lot of this weakness stems from the anime trying to do too much at once. Lots of new ideas are created, introduced, and accepted without any basis. For instance, an extremely minor character can talk to trees, the heavens have atom bombs, and the quite-convenient Soul Call method of saving gods. Then the weird writing choices. Kugaha, the villain from the first half, reappears and disappears within the span of five minutes, his only purpose to prove how both weak and strong Yukine is. The whole aside with Hiyori getting kissed, and then easily getting her memories back after it turned into such a huge issue for her, was lame since none of it mattered. And the even-more-than-quite-convenient finding of Yato’s true name during the Soul Call feels a bit unnatural. It all comes together as sloppy. A shame, especially after the first half did so swell. Even so, Aragoto’s second half still has many parts worth praising. The second half capitalizes on the idea of reincarnation that got introduced in the first half. Parallelism exists between the first and second half, such as with the releasing of Regalia and the inkling feelings of love between humans and gods. And even something as simple as Bishamon using Aiha in battle (the suit of armor Bishamon wears in the second half) reinforces the idea that a new leaf has been turned, a second chance given. The themes are also exempt from the problems. Loneliness, not giving up, and self-discovery do not have the same nuanced construction as the first half’s themes, but they still have connections. Yato, Yukine, and Hiyori are in separate plotlines (loneliness), doing their best to fight, train, or remember (not giving up) to better themselves (self-discovery). Granted, these details all rely on the first half setting them up, but they still help to bolster some of the weaknesses within Ebisu’s arc. Plus, the series’ signature comedy-and-drama mix persists. 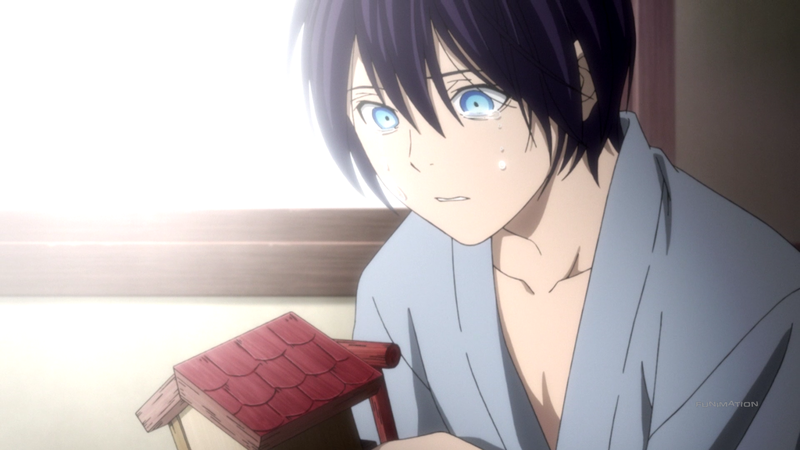 For example, Yukine, with money in his eyeballs, contemplates leaving Yato. Another example is Ebisu clumsily making eye contact with Phantoms in the underworld despite being told otherwise. Both examples demonstrate the show still knows when to and how to inject comedy at just the right moment. Altogether, it’s a tough call. A stellar first half leads into a mixed second half that’s more positive than negative, leading to a generally positive narrative. The character designs within Aragoto are technically simple, but they “say” a lot about the characters. Hiyori’s fading, pink tail highlights both her ghostly ability and her kindness. Yato’s sharp blue eyes reflect the hardened person within. And Yukine’s worker’s outfit indicates the amount of effort he puts into making himself a stronger Blessed Vessel. Bishamon and Ebisu have even better designs. Bishamon’s long, blonde hair, purple eyes, and fierce expression turn her into the battle-born beauty she happens to be. Also, her professional look when she visits the heavens, with her hair in a bun and a general’s outfit, is an awesome extra treat. Ebisu, by contrast, does not stick out: short, black hair, deadened-green eyes, and a plain buttoned shirt with tie. It’s quite symbolic – he constantly reincarnates, meaning his common appearance matches his repetitive life. Looking at the rest of the art tends to be tiresome. The locations visited, such as Koufuku’s home or Bishamon’s castle, are not that detailed. But the second half gets the worst of it when much of the setting takes place in purple-walled caverns, eliminating any chance for artistry. Lighting at least gets played with – different colored lights and an emphasis on darkness provide the anime with opportunities for flashiness. Animation as well does not keep up. Certain scenes, like Yato’s rending or a Phantom’s death, are reused. Battles include many explosions or cuts to give the illusion of fighting. And characters do not have fluid hair or eye movements unless extreme close-ups are used. Comedic moments, such as Hiyori flailing her arms or Yato jumping around, are not complete turnarounds, but they give the anime more movement than it usually used. However, the ED’s visuals deserve a mention. 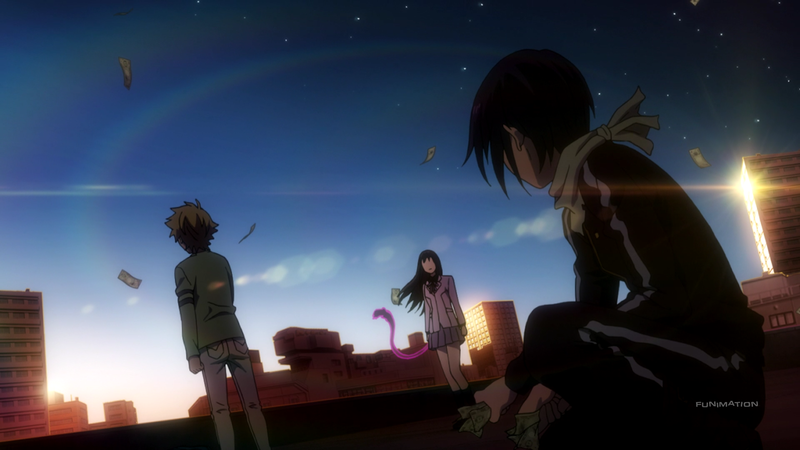 The first season’s ED’s visuals had Hiyori running from right to left in order to catch up with Yato and Yukine. This time, the ED visuals have Yato running from left to right in order to catch up with Hiyori and Yukine. A subtle detail that puts Yato’s own plight into perspective. Arguably the strongest aspect of Aragoto is its cast. Many members of the cast experience extensive change. The easiest example being Bishamon. She starts the season showcasing her multisided personality. In the heavens, she is the benevolent woman who saves wandering souls. On Earth, she is the mighty war god whose power knows no bounds. And around Yato, her seething hatred is almost disturbing. The reason for her hatred towards the god of calamity has been kept secret – until now. In the past, Bishamon led a different clan of people, people very similar to the ones she leads now. At some point, Bishamon began to get sick (or “blighted” as the lore of the anime puts it). Sickness of a god comes from Phantoms and their ilk, but it can also derive from unruly Regalia. That’s what presumably happens within Bishamon’s old clan. As she gets sicker, her people begin to grow uneasy. Eventually, they start to blame each other, leading to infighting and mass violence. Cue Kazuma. The audience was made aware of Bishamon’s most loyal follower in the first season. Respectful, strategic, and powerful, Kazuma makes a case for being the best Regalia in existence. But, in that first season, he is seemingly in debt to Yato, the man that Bishamon hates more than anyone else alive. A strange detail that goes unexplained much like Bishamon’s past. And, much like Bishamon’s own reveal, comes to the surface. During that past infighting, Bishamon’s clan turned into a massive, blob-like Phantom, having been consumed by their own sins. Kazuma’s love for Bishamon drove him to seek out Yato – the god known for absolute destruction. 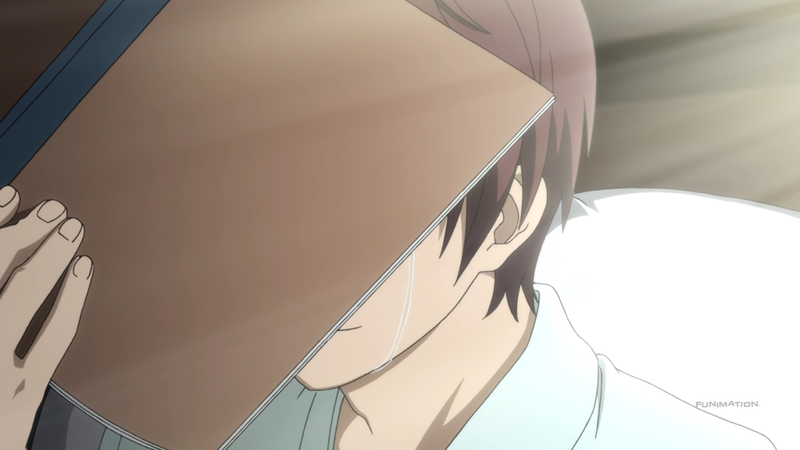 Yato, thankfully, listened to Kazuma’s cries. Yato arrives, easily slaying the beast. To Bishamon, however, he was not saving her or the others. To Bishamon, he killed her family. Yato is Bishamon’s (mistaken) enemy, and Yato is Kazuma’s (unmistaken) savior. That’s where their respective hatred and gratitude towards Yato come from, and it is their pasts and the current affairs that cause the present rift between them. Bishamon exiles Kazuma, her hatred for Yato consumes her, and Kazuma once again fails to protect his beloved. Combined with the loss of most of her clan once more, this tragic repetition of events hurts to see. But said tragedy allows them to grow through a “fool me once, shame on you; fool me twice, shame on me” mentality. Bishamon learns to take responsibility as the god she is. Rather than hating Yato to mask her own failure, which holds parallels with masking the pain from her various Regalia, she embraces her can-do-no-wrong status. She shoulders the pain and the suffering and the demise of her people, finally releasing herself from the torment and rage she has felt for all these years. In the final half of the season, attention shifts away from Bishamon and Kazuma and moves towards Yato and Ebisu. Ebisu does not initially seem to be a character worth remembering, but he proves that wrong time and again over the course of his arc. In the beginning, he comes off as evil, subduing Phantoms to bend to his will (using masks that the enemy likewise own). Such subjugations render him sick and feeble. So much so that he constantly finds himself reincarnating, passing on his knowledge and lineage to his next self. In the meantime, Yato finds himself improving. Yukine’s recent transformation and Bishamon dropping her grudge are no doubt positives. But it’s his refusal to forsake Hiyori and his later breakdown after receiving his very own (dinky) shrine from her that begins to change him for the better. Yet he unfortunately finds himself at the mercy of Nora and his father. He does their bidding, killing target after target – while slowly losing track of the time and world around him. Lo and behold that Yato’s path crosses with Ebisu in the underworld – a fitting place for the two shady men. Yet what Yato learns of the Phantom-controlling god is that he is not, in fact, out to harm the heavens. Instead, his (multi) life’s work has been to find the ultimate means in controlling the Phantoms so that he may better protect humanity. I.e., he has sacrificed his position, his life, and his self for the betterment of people. Yato can really relate to Ebisu’s path since he has taken a similar one. Being the “bad guy” for Bishamon this season, the “bad guy” for Yukine last season, and so on. Even more striking is how Yato can see himself in Ebisu. Yato has almost always been controlled by others: Nora, the heavens, and so on. So when Ebisu seemingly does not have a sense of self, that he believes he has no say in the life he leads since he “should” inevitably reincarnate like all of the others before him, Yato empathizes with the god completely. That’s what makes Ebisu’s shift in thought and tragic death so moving. It’s not just Ebisu finally realizing that he wants to live and carve his own path only to have his life immediately taken from him. It’s also Yato seeing someone with a truly good intent, someone that he somewhat understands, lose his life. The outcome affects him severely. He laments to (the now little) Ebisu about how much stronger of a person Ebisu is compared to himself. He astonishingly releases Nora, the Regalia he has had for ages, from him, representing the new chapter in his life he wishes to unfold. And, with Yukine and Hiyori’s help, he discovers what he wants to do with his life to bring about his and others’ happiness: destroying Phantoms. The only characters that have notable problems are Nora and Hiyori. For Nora, she has a deep affection (perhaps obsession) with Yato. Despite how rudely he treats her, she always comes back to his side no matter what. But she rarely interacts with the other characters in the anime, and the miniscule backstory (given through quick, single-shot flashbacks) leaves her character in a rough spot. 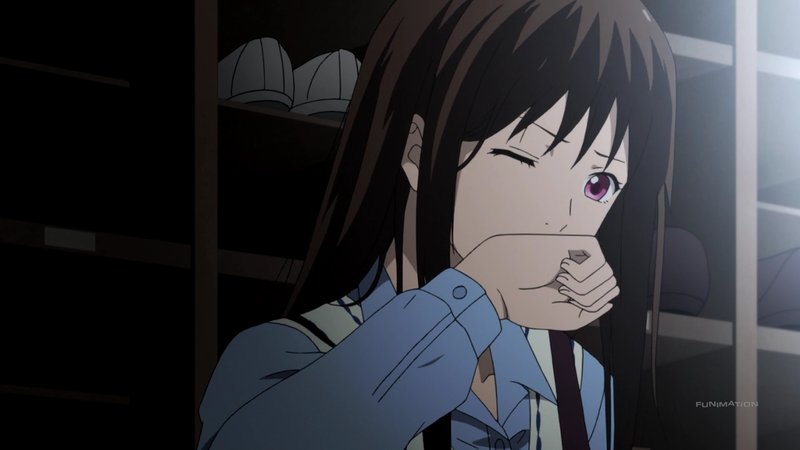 Hiyori, though, has it even worse. The first arc has the excuse that she was not a major player in the festivities (besides acting as blackmail towards Yato). The second arc, however, does not have the same excuse. Her conflict revolves around her forgetting Yato and Yukine, blaming arrogance on her part. In essence, her problem matches Nora: She does not interact enough with everyone else to see change. Indeed, she more or less goes back to being the same person following her recollection of memories, and, besides yelling Yato’s (fake) name a lot, she minimally impacts the proceedings. Aragoto’s opening track looks to its first season’s OP for inspiration, taking on the same cool vibe (and visuals). While the lyrics tread into silly territory (“I swear I respect the hero! !”), the catchiness of the beat and the background choir make the piece a nice lead-in and addition to the anime. Similarly, the ending track looks back at the original ED. But, dissimilar to the OP, the ED is as phenomenal as can be. The calm, joyful start, followed by the relaxed middle, and ending with the frantic yet optimistic tone, all the while laced with some strong vocal work, create a track that is emotional and sweet and amazing. The rest of the sounds within Aragoto aim for ambiance. Signature tracks like the stepping, spooky chant or the chimed, techno one work to make the atmosphere as mysterious or as lighthearted as needed. Plus, the extra touches, like the handling and usage of Yato’s swords and the broken speech of the Phantoms, help to make the anime that much more well-rounded. Lastly, voice acting sees nice performances if only because the cast has many an opportunity to strut their stuff. Hiroshi Kamiya as Yato speaks both humorously and emotionally at just the right moments. Miyuki Sawashiro as Bishamon cries from the mental anguish she experiences. And Ryotaro Okiayu as Ebisu utters his (previous life’s) last line in a way that could sway any heart. I was quite impressed with the first arc of this season. So much going on both with the narrative and the characters that it was almost unfair. Lots of drama, of course, but the anime always managed to sneak in some comedy whenever it could, like when Yato was sending passive-aggressive messages to Hiyori’s phone about Yukine because he was worried about the boy. The second half was a toss-up. On the one hand, that ending scene with Ebisu and Yato’s talk with the young boy afterwards got to me. Not totally crying, but I could feel the beginnings of it in my chest. On the other hand, the whole aside with the one dude (who, turns out, is actually Yato’s father in disguise) kissing Hiyori made me quite frustrated since I accept nothing less than Hiyori getting together with Yato. Thankfully, she was not interested at all, going so far as to rub her mouth with the back of her hand. Just that small gesture made me happy to see. But none of that had to happened if they Hiyori would have been with Yukine and Yato. Which leads into my biggest complaint with this season: the main three were not together enough. Yes, none of the show would have happened if they were always together, but them being as distant with each other as they were made for less laughs, less interactions, and overall less entertainment. Noragami Aragoto does well for itself. The story and the characters are not all perfect, but they have their strong points. As does the music. However, the unimpressive art and the characters splitting up does unwanted harm. Hopefully this one’s main visual will evoke that same sense of wonder years from now….